TTMT #335 and the EQ7 Row Along! 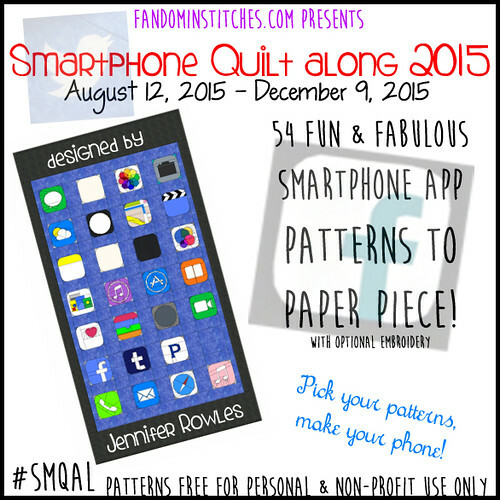 Welcome to week three in the EQ7: Seasons Row Along, hosted by Marian at Seams to be Sew! I’m especially excited today, because it’s MY WEEK! Be sure to scroll through for the free PDF pattern for my row, a fun alternative project idea and to enter to win one of THREE fun gifts! Here it is! My Spring row! Spring is my favorite season. The winter blues are driven away, the trees begin to bud, spring babies are born and the earth begins to turn green again! OR Download the PDF Via Craftsy! PJ7 Pattern will be emailed upon request. Please contact sewhooked@gmail.com. Hear me talk about my row and other projects I’m working on my video blog, Talk to Me Tuesday! 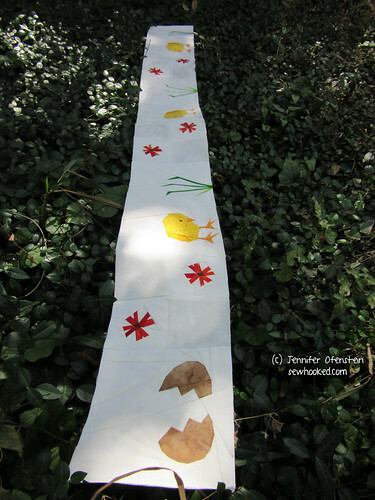 My idea was to celebrate my favorite season with baby chicks, fresh out of their eggs, pecking around the grass and flowers for something good to eat. 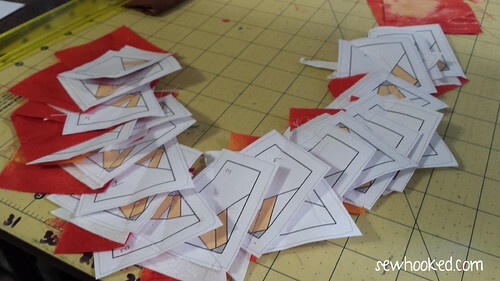 Every pattern in my row is a 6″ (6 1/2″ unfinished) paper pieced block. Follow the instructions in the pattern to make this row, or mix and match to make your own fun row or other quilty project! I’m absolutely loving the beautiful tonal white background fabric from Northcott! Anyone that visits regularly knows that I’m a bit of a Northcott junkie with Stonehenge being one of my all time favorite fabrics! 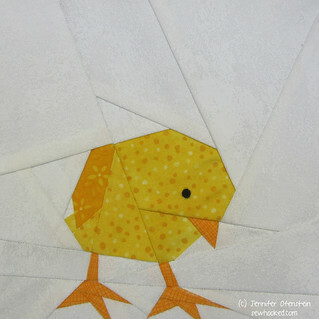 The entire row is paper pieced with optional embroidery or paint for the chicks’ eyes. I drew mine on using Tulip Fabric Markers. Small pieces freak you out? Try chain piecing them! Want something completely different? The patterns for my row can also be turned into a fun quilt! I plan to make one very much like this for my favorite blanket charity, The Linus Connection. Need to learn to paper piece or just want some pointers? I have a page dedicated to helping you learn, including free tutorials (both text and video) and links to lots of resources! And now, even more fun… GIFTS FOR YOU! I will be giving away one of each of the following gifts. The first two links are for separate giveaways, so make sure you click each of them and follow the instructions to enter. Some conditions apply, so please make sure you read our Sponsor’s Guidelines for entering. Don’t miss the ongoing Flickr giveaway at the bottom of this post! Northcott is giving 1 lucky recipient 6-8 pieces of fabric at 1 yard lengths each. This giveaway for all of today’s featured blogs. You may enter only once. Fat Quarter Shop is giving away $25.00 gift certificates to one winner from each RAL Blog. You can only enter once at this blog. My apologies for the links, the Rafflecopter widget does not work on blogs hosted on WordPress.com. You are responsible for claiming and paying any tax owed on the value of any gift that you win. All gifts will be given between September 01, 2015 and October 06, 2015. Winners will receive notification via email. Winners have approximately 7 days to claim their gift, if 7 days passes, the gift will be offered to another eligible entrant. Winners who will receive a shipped item, will need to provide, name, address, city, state/province and country along with a phone number. All international winners will be responsible for any fees customs chooses to assess. Winners where prizes can be delivered via email, must provide a name, country and a valid email address. All prizes will be awarded. All winners will be announced on the blogs where they won and at Seams To Be Sew. Winners agree to allow their name, city, state and/or country to be publicized. While we hope you will comment on the posts of the day and we love comments, we want no reply bloggers to have a chance at winning also All bloggers will use Rafflecopter to give their gifts away. You will be asked for your name, email, city, state, and country. (City, State, Country will be asked to identify any winner where the same name may per chance happen). Some restrictions on gifts will apply based on shipping policies. Odds of Winning a prize are based on total number of Rafflecopter entries during each week and in total for all giveaways. Canadians will be subjected to a question in order to enter. Thanks for joining me, I hope you enjoyed my row and all the fun goodies in this post! This entry was posted in Blog Hop, talk to me tuesday, vlog and tagged blog hop, eq7, eq7ral, event, qal, ral, talk to me tuesday, ttmt on September 15, 2015 by Jennifer Ofenstein. I definitely love Spring, I love your row. And the vintage blocks is also beautiful. Fall is my favorite time of year. The weather is perfect for walking, exploring and enjoying nature. I love autunm very much, but every season has some wonderful things in it! Your chicks are so adorable. Thanks for this cute row! Fall is my favorite season. Cold nights & warm days, changing leaves & college football. Thanks. Thanks for a cute row, to me…Fall is chick season, we get ours in the Fall so that we never have to worry about losing any to the cold that sometimes happens in the Spring. We have 15 of them right now that are about 2 weeks old. My favorite season is summer, but my favorite row on this row-by-row is your spring row. The chicks are so cute! Hi Jennifer- I think my favorite season is spring- once everything starts blossoming. It’s beautiful here in Indiana! Thanks for the cute pattern and the give-a-way! I love spring! All the new greens, the crocus and tulips, the flowering forsythia and lilacs! Spring! New greens, crocus, tulips, flowering forsythia and oh, the lilacs!!! Jennifer, your little chicks are just so cute. And that egg!!! Such a fun row. How clever of you to come up with a little quilt layout for your blocks! Thanks so much for sharing the pattern! Summer is my favorite season, and it is all too short! I absolutely love your Spring row, especially how you used it to make a little quilt. 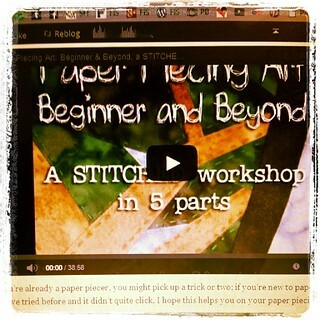 Simply adorable, and I do love paper piecing. Thanks for the opportunity to win. Your row is so sweet and putting it in a quilt like that is a great idea! I love watching the Spring flowers bloom. Having lived in the deep south most of my life I never really experienced FALL. Now I live in SW Missouri and it’s my absolute favorite season! Fall is my favorite season. 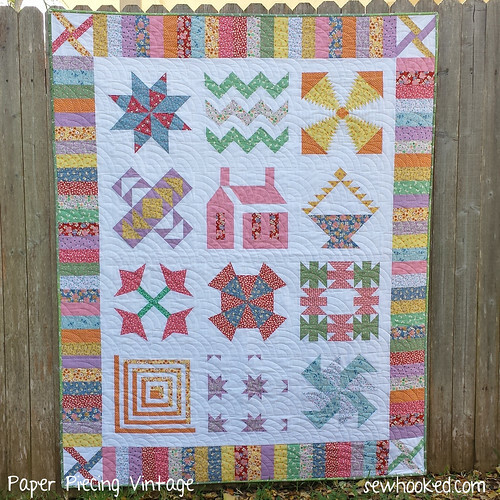 Love your row and the quilt blocks using your pattern. Thank you for the free designs, and the tutorials. these little chicks are so adorable. thank you for the pattern. my favorite season is summer. all the flowers are blooming, the garden is coming to life, the warm weather, no bundling up. As you know, I love this row, I love the video, it’s amazing how busy you are and still find time for all the many things you do. Turning this into a quilt also is a fab idea, love that you thought to baste the row into place so it’s easily taken apart.. I have really enjoyed having you be part of this Row-Along with me Jennifer and I hope we see each other more often. As you know I love this row, I had no idea how busy you really are, but I am simply amazed that you do all that you do. 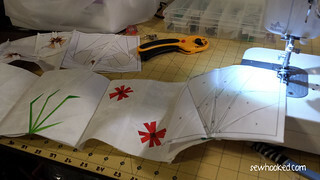 I thought it was pretty clever to baste the row together so that you can take it apart later to put it in a quilt, that’s a very clever trick, thanks for sharing it in the video. Thank you sew much for participating with me in this Row Along. I hope we’ll have many more bright spots in the future.. You’ve really and truly been a gem. I have a hard time choosing a season! Colorado is so beautiful all year around. If I *had* to choose, I’d say fall because I’m ready for the fall colors and the cool weather! Fall is my favorite season and it is on the way! Yippee! Halloween is also my favorite holiday! 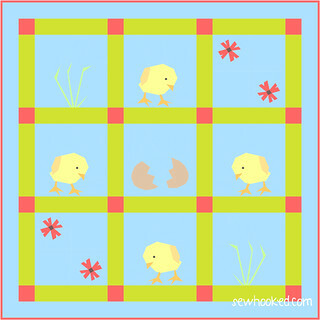 Love the chicks row…thank you for another wonderful pattern. My favorite season is fall. Cool weather, football, apple picking, pumpkins…and of course Halloween. Fall is my favorite season. I like the cooler temperatures, the changing colors and the wonderful scents. I forgot to mention, that the download isn’t working. I either get an error message or it comes up with a blank page. I have tried several different times. Is there another way to get the pattern? I I love Autumn, I like the temps cooling down, the changing colors and Apple Hill! My favorite season is definitely fall. I love the changing of colors, the crisp air and the perfect temperatures. I adore you’re spring row! It’s very cute. Love your row! Cute little chicks! Looking forward to your TMT each week too. and summer is actually my favorite season. Great chicks. I love summer. Seems like Fall Fever is running high this week. I am also a lover of Fall. I may live in the Sunshine State but I have to go home to the mountains of NC every October. Thanks for all the work you do and share with us. Such a cute row. My favorite season is Fall, love the colors, the harvest of foods, and cool weather. Thank you for being on WordPress, in spite of some things that don’t work on it. I really much prefer it for me, and for blogs on which to comment. Your row is adorable! I’m not a fan of paper-piecing, but I might have to knuckle down and do these blocks. Either as a row or as a baby quilt, it’s adorable! I also appreciated how many times you put the link in the post. You made it really EASY to get the pattern! Summer would be my favorite season. I enjoy gardening and love to be outside when the weather is nice. I like all seasons. they each have there own unique qualities. I love to paper piece. Your quilt is beautiful. Summer, no school. More time with grand children! ! Fall is my favorite season, although there are things I like about every season. Even though it is many years since I was in school, fall always seems like the time of new beginnings and new opportunities, plus I just love the cooler weather after a long Texas summer. Love your spring time row but winter is actually my favorite season! I love watching the snow fall and curling up under a pile of blankets with a cup of coffee and a good book. Winter gives you an excuse to stay in your warm flannel pajamas. My favorite time of year is the spring with all the AZ desert wildflowers and warm (not hot!) weather. Love your row. Also your blog. I have to say that I love fall. The beautiful colors with cooler air. I love Summer (and spring) when I can be outside enjoying my garden! Your row is very cute! I love the autumn so colorful! The Vintage pattern would be perfect for using up the thirties fabrics that I have. Fall is my favourite season. I love the cooler temperatures. It makes for great walking weather, the leaves are gorgeous in all their changing colours and I absolutely love kicking the fallen leaves as I walk. I just love your patterns!!! My favorite season is summer. Have a wonderful day! I love spring when colors come alive from the dead of winter. Fall is beautiful too with the changes of color. I believe I enjoy fall the most– my favorite color palette, changing weather and not such a fast pace. I share the same love of spring as you do! I love seeing the world around me come alive again after a very long cold, snowy winter. It is worth waiting for! What cute little chicks! I think I like fall best. It is cooler, the weather is more stable, and it is leading up to the holidays. Thanks for the chance. TTMT is the highlight of my week. After work on Tuesdays, I drop everything and get to my computer to check in with you. Thanks! My favorite season is Autumn. The beautiful fall colors and cool nights. Fall is my favorite time of year. I love the cooler temps, and the colors of fall foliage. I love your baby chicks. My favorite season is Fall. Love the coolness and coming from a farming background, the harvest! fall is my favorite season, and i love your chickies.